Daylight Saving Time ends in the United States and Canada on November 4th at 2:00am. I remember I used to get so excited about “falling back,”aka, Daylight Saving Time. I would use those extra 60 minutes for catching up on sleep, or I would just take the time to enjoy another hour of the crisp fall weather. This was all BC, Before Children. But have you ever wondered why we have Daylight Savings Time in the first place? While this quick little video can give you the background story of Daylight Saving Time , what it can’t do is change the dynamic of what’s happening in your home. It’s very normal and common for children to wake sometime between 6:00am – 7:30am in the morning. The tricky part about that is with the upcoming time change you very well could be receiving a 5:00am wake up call instead! Daylight Saving Time actually shifts the internal clock by more than 30 minutes so no matter what age or stage you are, it takes the body a few days to make the adjustment. The good news is that it can take 5-7 days to get back on track. The other good news is that if your little one has too late of a bedtime now, this could actually help you transition to an earlier one! Some families may choose to go cold turkey and adjust to the new time on Sunday. Be sure to throw in a bonus nap if you have a little one so they don’t get overtired by bedtime. 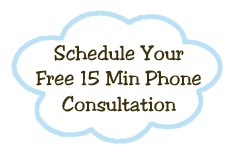 On Sunday and there after, adjust naps, meals and your routine to the Standard Time. This tends to be the approach most families use, mostly for the sake of adults and older children. 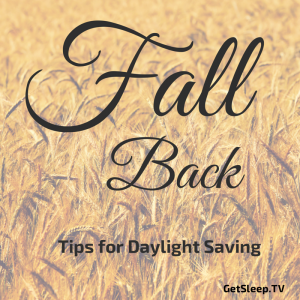 But what can you do to ease the transition for daylight saving time? Take the time to create a sleep plan for the upcoming change. Be consistent and follow through with your plan. Stick to your flexible routines. Routines help your child know what to expect and that soothing bedtime can slowly be transitioned. Be available. Make time to connect with your little one during the transition. It never fails that they need a little more TLC from mom or dad. Be patient with your child and yourself. Change is hard for everyone so be mindful of your responses during this transition. Since it’s normal and common for children younger than 5 to have bedtimes between 6:30 and 8:00pm , the week before Daylight Saving Time you can choose to make a 4 or 6 day plan which shifts the circadian rhythm in 10 or 15 minute increments. 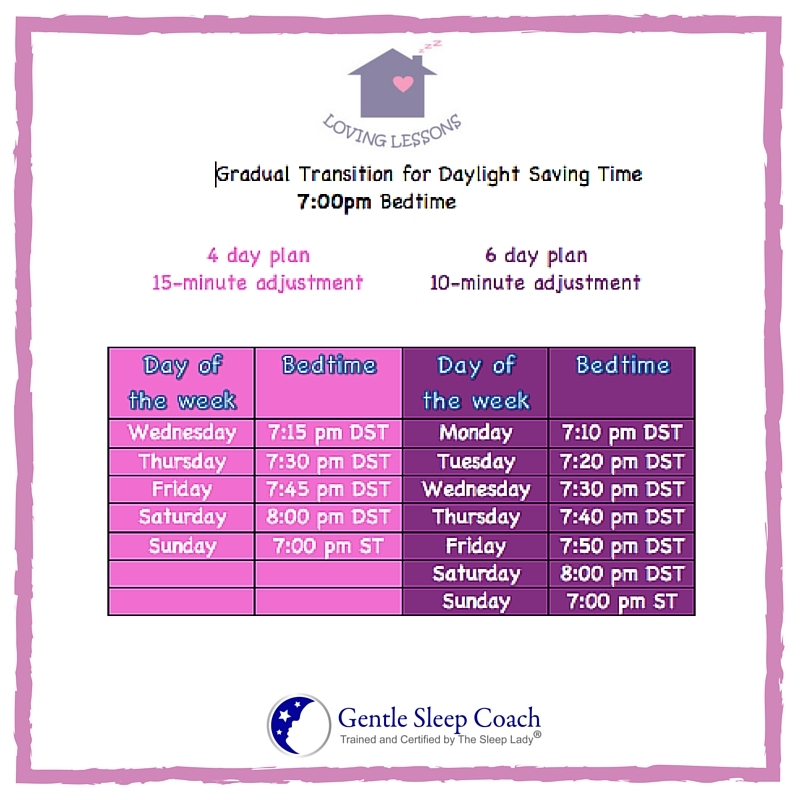 Create your plan for bedtime by using the chart I created as a sample schedule to simplify the transition. As you implement the bedtime transitions be sure to shift naps and meals in the same increments during those days too. Sometimes we may implement a plan to find that our little one still wakes up earlier than we would like. 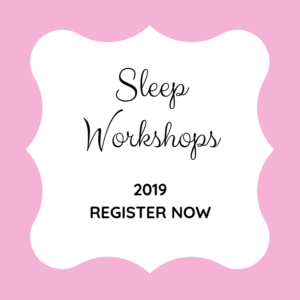 This will be a good time to start using your consistent response you’ve used to coach your child while getting sleep in place in your home. Some families may choose to shuffle their little one in the morning until it is their correct wake time. Getting outside first thing in the morning also helps reset the circadian rhythm, and that helps everyone feel better. If the weather is an issue, however, then consider playing in the sunshine next to a window that brings all the natural light into your home. Rest assured that within a week or so the transition will even itself out, and everyone will be back on track with the sleep habits you once had in your home! If after you’ve tried all these tips and you’re still not satisfied with your current sleep habits in your home, click here to set up a time on my calendar for us to talk. 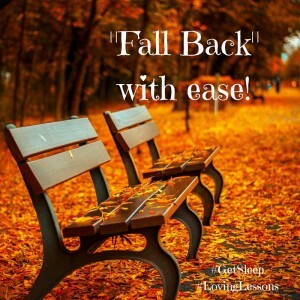 Sweet dreams, and this season “fall back” with ease!